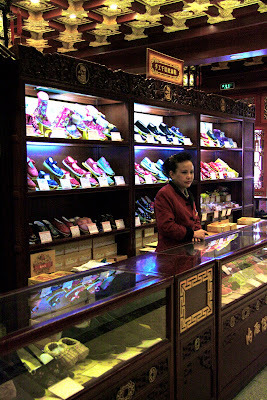 The outside of the store is highly decorated in gold, blue and red, and as you pass through the wide gold-trimmed doors you feel as though you have stepped back in time to an era when retail shopping began. I imagine the interior is laid out in much the same way as it has been for the last hundred years or so, the inside walls lined with shelves of cloth and leather shoes, and the wooden and glass cabinets displaying more of the same. A central island of shelves is surrounded on four sides by more glass cabinets, and these display the shop's premium shoes made from coloured and embroidered silk. 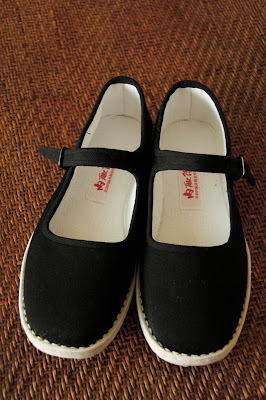 Of course I had to buy a pair - I chose a simple black traditional design with straps, they are as comfortable as slippers and will be perfect for tramping the streets of Shanghai in summer. 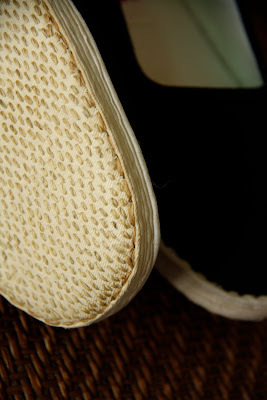 See how the sole is made from folded layers of fabric, stitched together? And how it is heavily hand-worked with tiny little stitches in hessian thread? How lovely is that?